Con­grat­u­la­tions to Geor­gia Coates on break­ing the British junior short course 200m indi­vid­ual med­ley record this morn­ing. Geor­gia set a new mark of 2:10.31 to fin­ish ninth at the Euro­pean Short Course Cham­pi­onships in Israel. Great job Geor­gia! We are all very proud of you. 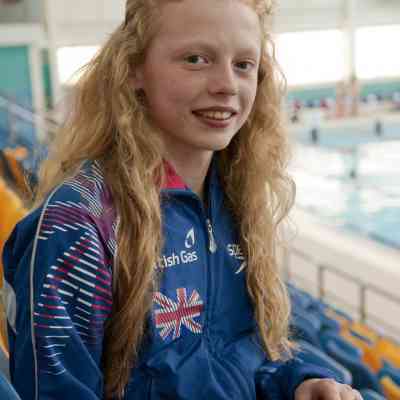 After a suc­cess­ful World Junior Cham­pi­onships in August, Geor­gia Coates will make her first senior inter­na­tion­al appear­ance when she rep­re­sents GB at the Euro­pean Short Course Cham­pi­onships this week. Team Leeds were in action at the Cor­by Inter­na­tion­al Pool for the sev­enth year in a row yes­ter­day. The coach­es and club are real­ly pleased with the effort and per­for­mances, improv­ing on last year’s result by three places. City of Leeds nar­row­ly lose out to Stock­port Metro but qual­i­fy for the Grand Final in November. A fan­tas­tic meet for the Region­al Squads this weekend. ‘A’ and ​‘B’ teams have been select­ed for the White Rose Junior League com­pe­ti­tion to be held on Sat­ur­day 11 July at John Charles Cen­tre for Sport. Please con­firm your avail­abil­i­ty to Craig Robin­son no lat­er than Mon­day 1 June. Swim­mers step up to the plate in a week of many life­time bests at the Lon­don Aquat­ics Centre. Fol­low­ing a review of domes­tic com­pe­ti­tion, British Swim­ming have made sev­er­al changes to the Com­pe­ti­tion Path­way which aim to improve swim­mer devel­op­ment in Britain. Our web­site has been redesigned to make it eas­i­er to use and mobile-friend­ly. To help you with the tran­si­tion, we have not­ed some of the biggest changes.